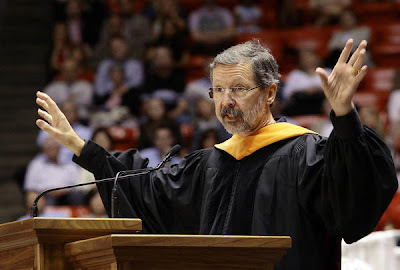 Ed Catmull "Two more inches, no Pixar"
Ed Catmull, President and co-founder of Pixar Animation Studios recently gave the commencement address to graduates of the University of Utah - Class of 2012 (May 4th, 2012). During the speech the audience was treated to a very powerful story - one that I myself, a self-proclaimed Pixar fan was unaware of. Posted from The Salt Lake Tribune, Ed Catmull notes that critical moments in life and business can be measured by two inches. This is where his story begins. During a family vacation to Yellowstone the Catmull family (Ed Catmull was 12 years old at the time) narrowly escaped a tragic accident. A minor fender bender on a narrow canyon road almost sent the family and their new 1957 Ford station wagon off the road and down a cliff. The space between life and tragedy for the Catmull family was two inches. "Two more inches, no Pixar. I have no way of conceiving the number of two-inch events in the lives of people at Pixar. When I describe those events to people, they say, 'You dodged a bullet,'" said Ed Catmull. "Whatever instinct you have for controlling the future, you have no way of accounting for all the two-inch events." Wow! I was completely moved by Ed Catmull's story and I wasn't even there to hear it in person. Reading the quote above really made me think of some of the "two-inch" moments that I have had in my life. To think that Pixar could have been lost by two inches - crazy! **UPDATE - A video of the Commencement speech has just been posted to the University of Utah's website. Mr. Ed Catmull is introduced at 98:25 into the video. It's FULL of interesting Pixar stories, like the story of UP - from a floating castle to eggs that give you eternal life. It was fascinating to hear the journey of creative genius that takes place at Pixar. If you are a Pixar fan or just a fan of absolute ingenuity you must watch this. So inspiring! Pixar Post: Ed Catmull "Two more inches, no Pixar"